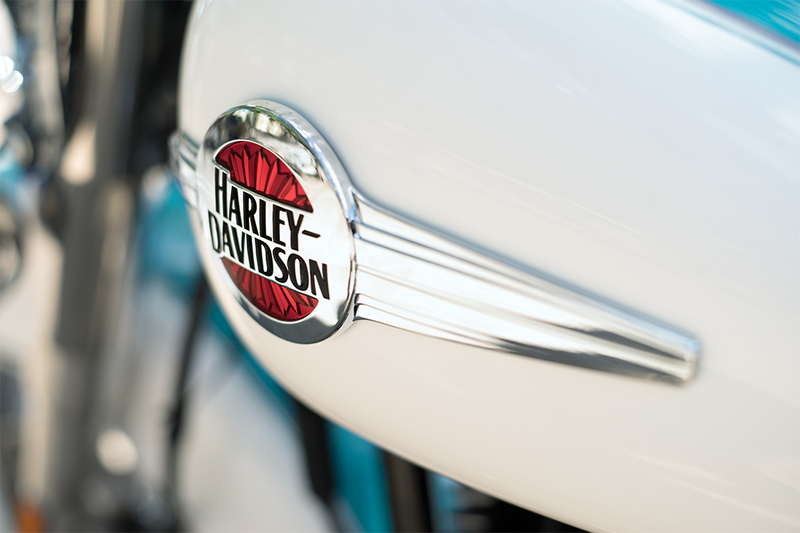 The new 2017 Harley-Davidson® Heritage Softail® Classic is an iconic cruiser crafted out of authentic Harley-Davidson® quality and tradition. 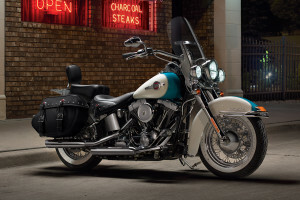 Part of the Softail® lineup, the Heritage Softail® Classic is available here at Riverside Harley-Davidson®, your Los Angeles and Inland Empire area Harley-Davidson® dealer. The 2017 model is more modern than ever while still maintaining its unique throwback style. Find out more about this distinctive bike below. The Heritage Softail® Classic is all about maintaining a classic dresser look that’s both visually appealing and functional. 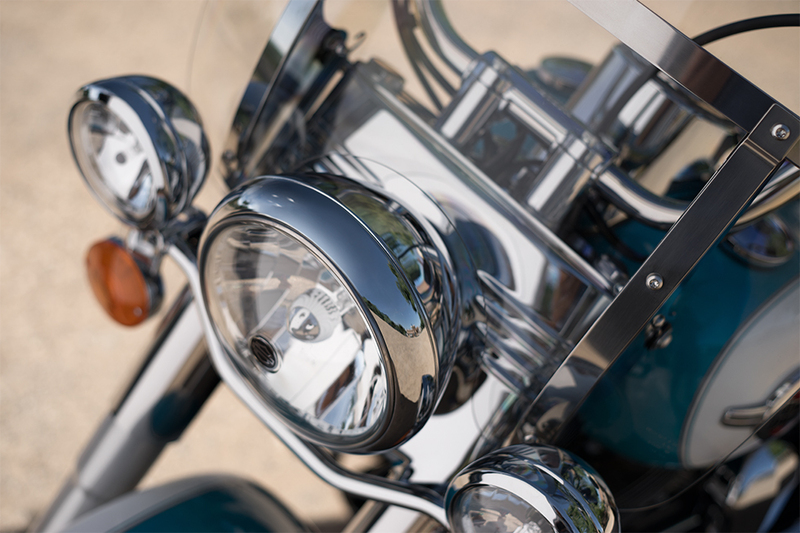 Old-School Tank and New 3-D Medallion: The glass-inlayed, cloisonné-and-chrome medallion on the Heritage Softail® Classic is mounted to the old-school, five-gallon fuel tank. 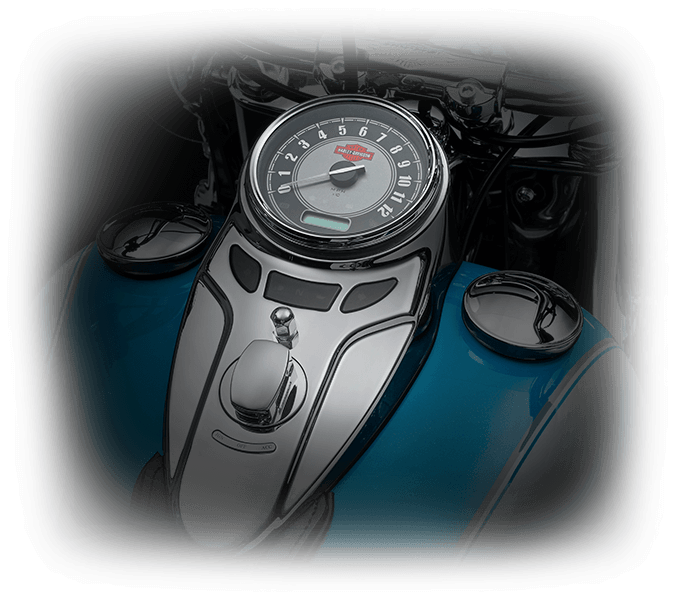 Nostalgic Custom Style: The laced wheels, whitewall tires, and studded leather contribute to the classic style of the bike, while also making for a smooth, comfortable ride. These classic features will make you want to jump on and head out for a long ride beyond the horizon. Hidden Rear Shocks: The hidden rear suspension is the distinctive feature of the entire Softail® lineup. It delivers a classic, rigid look that doesn’t sacrifice comfort. Tank-Mounted Console: The speedometer face boasts a bold display for the odometer, along with an ancillary display for gear and rpm. All this information is clearly located right there on the top of the tank. 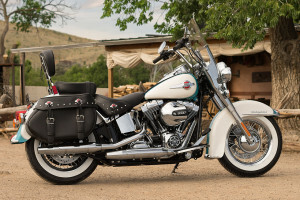 The Heritage Softail® Classic is powered by the iconic, high output Twin Cam 103TM V-Twin that puts plenty of power to the rear wheel via a Six-Speed Cruise Drive® Transmission. High Output Twin Cam 103BTM Engine Heritage: This engine is descended from legends like the Panhead, Shovelhead, Knucklehead, and others. It delivers modern features and battle-tested durability. High Output Twin Cam 103BTM Engine Innovation: The 103BTM offers careful tuning, electronic fuel injection, and lightweight pistons to deliver more power, refinement, and efficiency. High Output Twin Cam 103BTM Engine Power: You’ve got more power than ever, so whether you’re cruising solo with empty bags, or loaded up for a long weekend, it’s always easy to get up to speed. 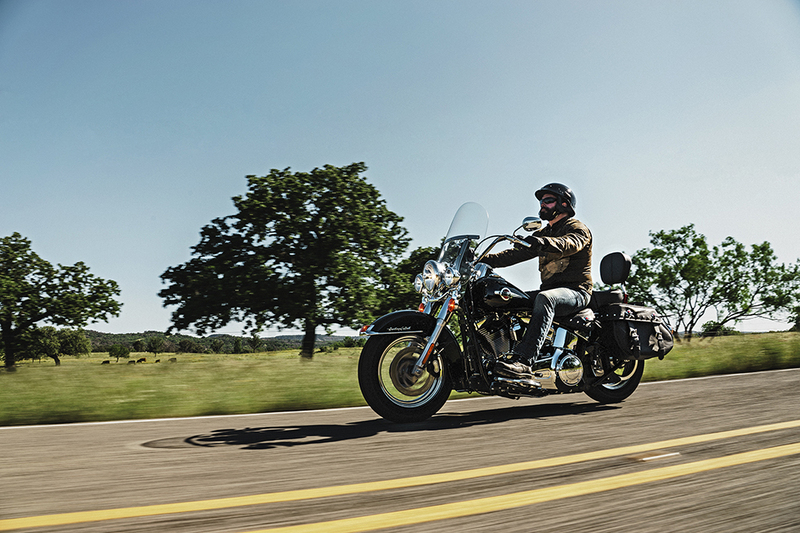 Six-Speed Cruise Drive® Transmission: The Heritage Softail® Classic’s smooth shifting makes for an incredibly responsive ride. Plus, its low engine speed on the highway makes for a smoother ride. 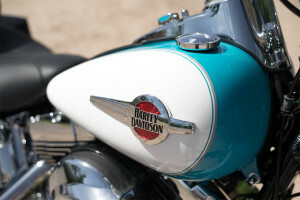 Pure Harley-Davidson Styling: It’s hard to deny that this engine looks fantastic. With distinctive 103 badging, chrome rocker covers, air filter cover, and machined cooling fin tips, it looks as good as it performs. 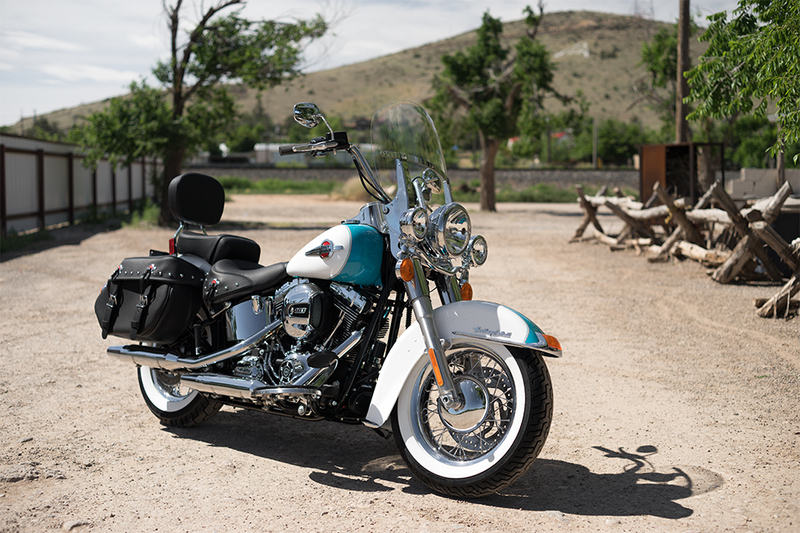 It’s easy to see that the Heritage Softail® Classic is a classic bike, but that doesn’t mean you have to give up the latest technology. Standard Anti-Lock Brakes: Standard antilock brakes help to slow things down in bad conditions by eliminating wheel lockup during hard braking. 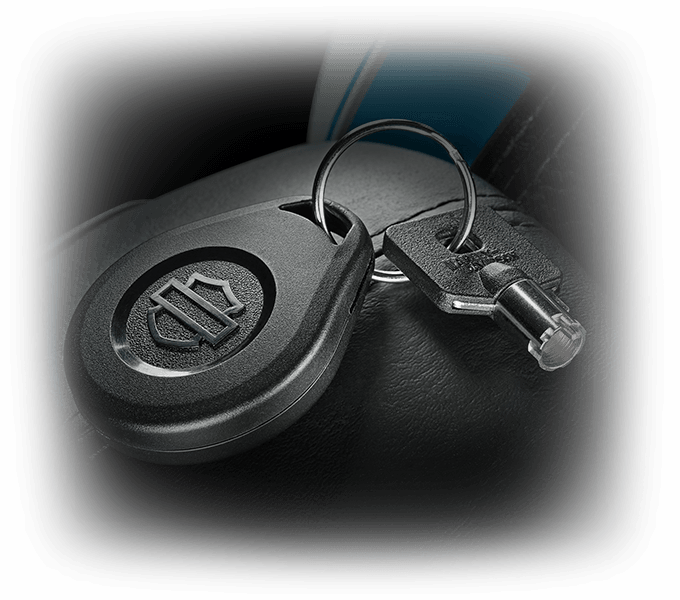 H-D® Smart Security System (Optional): This system utilizes a wireless keyfob that activates the system when you leave and deactivates it when you return. 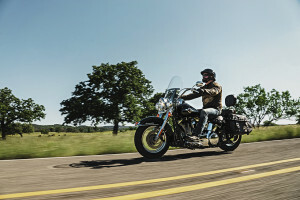 The Heritage Softail® Classic offers exceptional handling dynamics thanks to well tuned suspension, solid brakes, grippy tires, and light weight. Front Brake System: More braking power is never a bad thing. Now you need 40 percent less lever force to activate peak braking power, so you can always stop with ease. 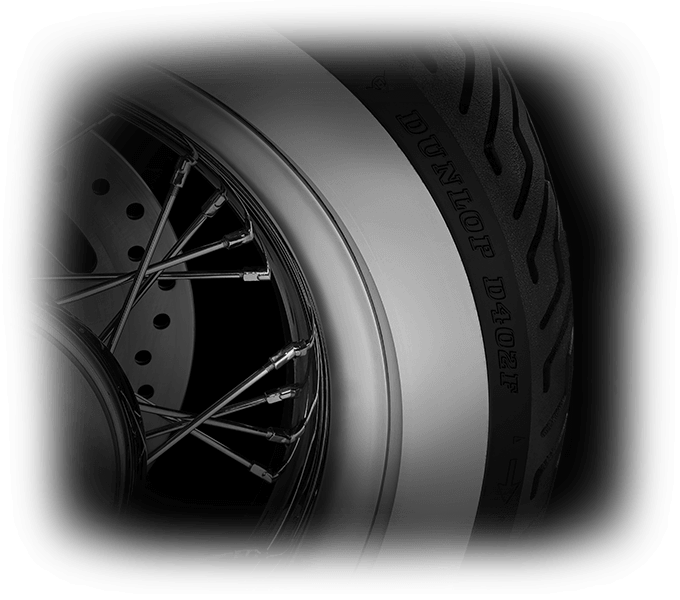 Dunlop® Tires: This premium rubber delivers the durability you want for long haul rides and the performance you need for leaning into corners. 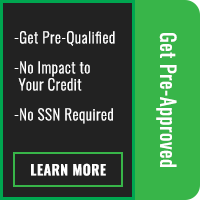 Electronic Throttle Control and Cruise Control: Electronic cruise control is standard equipment here, so it’s easier than ever to power through those long, empty stretches of road. Ergonomic Hand Controls: Ergonomically designed controls mean that they’re made to fit your hands, so you get both more control and more comfort. Comfort is essential when you’re planning to spend any length of time in the saddle. 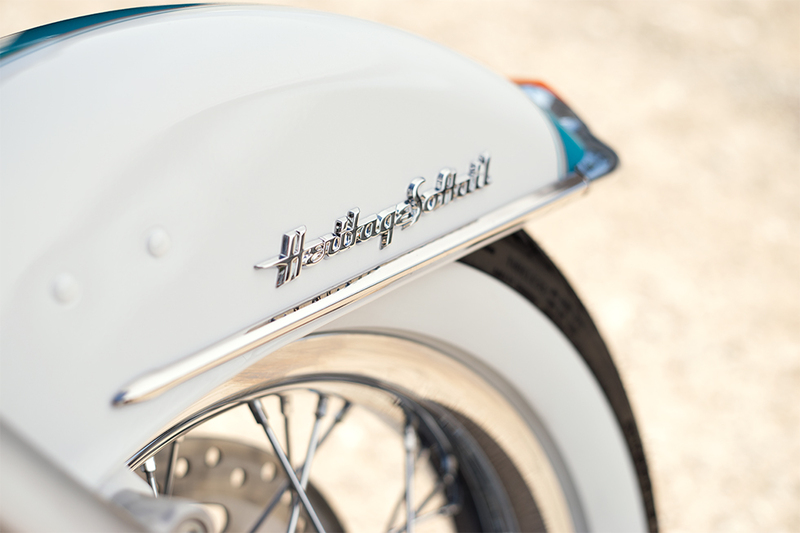 Luckily, with the Heritage Softail® Classic, you’ve got plenty of smart comfort features. 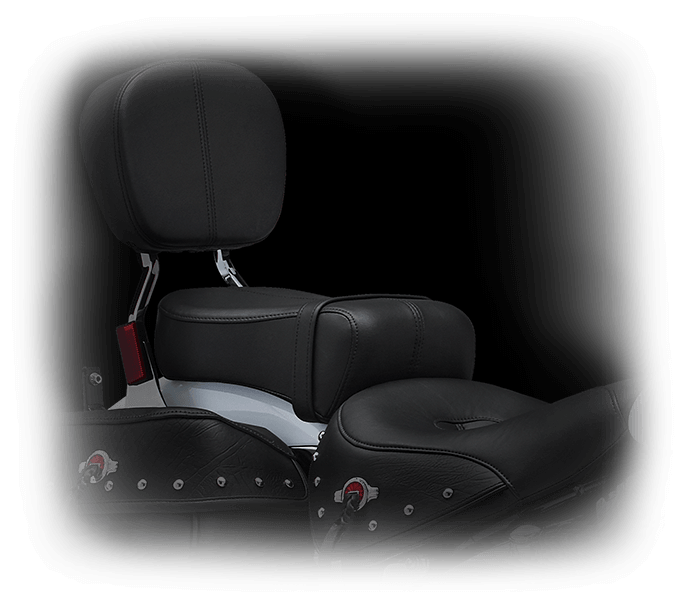 Convertible Two-Piece Seat: The Heritage Softail® Classic showcases a unique two-up seat to keep you and your passenger comfortable. It also features old-school styling including a studded valance that matches the saddlebags. Full-Length Rider Footboards: It’s essential to put your feet where you want them, and with the full length floor boards, you can, and the rubber isolation helps cut vibration for added comfort. Tall Handlebar: These handlebars are designed to keep you comfortably in control with a tall position and a generous sweep. Detachable Windshield: Heading out on the highway? Attach the windshield for more protection. Just riding around town? Take it off for a sleek, minimal look that just screams power.